2013 was iffy for a lot of people, but it brought great things to the pop culture front! Before we get too far into 2014, I wanted to touch on a few things that really made this past year shine. What if all superheroes turned out to be supervillains? This was, hands down, my favorite book of the year. Immediately compelling and engaging, it follows the journey of a young man named David, who is looking for revenge against the death of his father by the hands of a man named Steelheart, who is the most powerful of the Epics - humans that for unknown reasons have been gifted with powers beyond those of mere mortals, which they wield for personal gain. 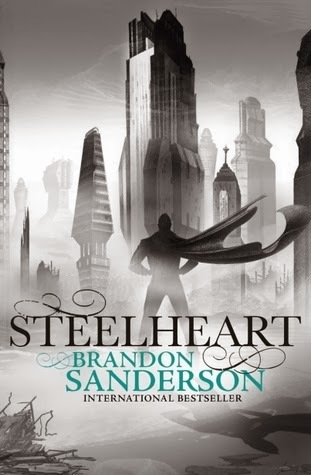 Steelheart is a kind of dark superman, almost completely invincible who has taken the city of Chicago and turned it into Newcago - his own personal empire. David joins the ranks of the Reckoners, a small group of rebels fighting to take back humanity by taking down the regime - one Epic at a time. The message of fighting against fear and freeing oneself from its terrifying grip is something that struck a deep chord within me. I had no idea what twists and turns this story was going to take next, and what starts out as a tale of vengeance develops into a tale far deeper and profound. The audiobook, narrated by Macleod Andrews, delivers all the suspense of this gripping young adult novel with a voice that transitions from the young, optimistic tones of David to the deeper, grittier vocals of Prof, head of The Reckoners. Andrews also engages listeners with convincing French and Southern accents as well as realistic and diverse feminine voices, fully realizing the unique personalities within the Reckoners. The result is the perfect marriage of masterful writing and versatile narration. Click here to listen to a sample of the audiobook. Toby sez: Great read and a great listen. Doesn't get much better than this. ComiCONN was an absolute blast for this first-time attendee. Held in the Hotel Marriot in Trumbull, Conn. on August 24, 2013, it was the perfect wrap-up to the convention summer season and had an amazing number of awesome cosplayers. Take a look for yourself in the slideshow below - everything from old school Adam West Batman to Thor and Tony Stark. In fact, it was such a hit that the show goes on for its fifth year with an expanded venue at the Webster Bank Arena in Bridgeport, Conn and will be extended two more days - from August 15-17. What I enjoyed about it was it stuck to the roots of its fandom - comic books - while also making room for independent artists and authors as well. For instance, I ran into artist Luke Foster, whose 2013 project Drawn Away chronicled his 2013 tour across America in a cartoon/memoir format. He is also the creator, illustrator and writer of The Gang From the Store: True Tales from the Comic Book Shop, which ran from November 2009 to June 2010; and Moon Freight 3, which ran from August 2008 to November 2012. 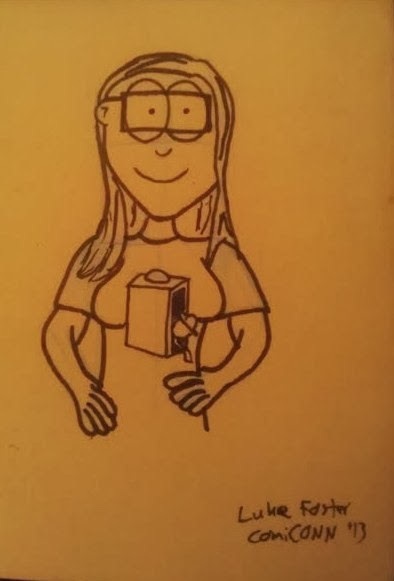 He was also kind enough to draw a fun picture of The Critic herself! Right around the corner from Luke Foster's booth was, lo and behold, Larry Kenney! An incredibly versatile voice actor and radio personality, Mr. Kenney is best known for voicing Lion-O in the original 1985 Thundercats series, and he also contributed his talents as Claudus in the Thundercats 2011 reboot. He is also the voice of Count Chocula and Sonny in the Cocoa Puffs cereal commercials. He was an incredibly fun guy to talk to, signed my Lion-O print with a very kind note, and was truly an unexpected treat to meet! He can also be heard in Grand Theft Auto IV as The Beat 102.7 announcer. What truly made this con fun was the accessibility of all the artists and guests - no long lines, no massive crowds to fight through - it was well-organized and gave everyone from Batman to Dr. Who fans something fun to enjoy. No wonder they decided to expand it for 2014! Plans are underway for a Dark Nite Club V.I.P. Party starring "The Bat Pack" - looking forward to see what that's all about. Toby sez: Good things come in small packages. Looking forward to this year's expansion pack. 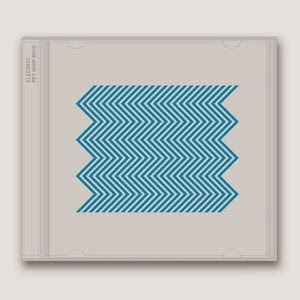 On July 15, 2013 the classic British pop-synth duo Pet Shop Boys dropped their newest album Electric and gave electronica a fierce wake-up call. This marks their twelfth studio album. The first instrumental track "Axis"makes the listener feel like they are taking a ride on a light cycle in Tron. It demonstrates the complete metamorphosis the duo has made into the sleeker butterfly of electronica while still keeping the best of their distinctly 80s roots. Unlike their more reflective album Elysium, which dropped without much fanfare on September of 2012, Electric brings the dance beats down hard, particularly with "Shouting in the Evening" and the feel-good dance hit "Thursday" (which even incorporates little bells!). But it's far from fluff. Neil Tennant and Chris Lowe stay true to their characteristic trademarks of thoughtful lyrics and strong - sometimes harsh - stances towards humanity, particularly during their haunting cover of Bruce Springsteen's "The Last to Die." Tennant and Lowe have always had a knack for creating thematic moods for each of their albums, and while I wouldn't call this my favorite album of all time, it shows a definitive step in a new direction for their sound as they explore the outer limits of their synth/pop signature sound. Pet Shop Boys performing their 2003 hit "Miracles" during their 2013 Electric Tour at House of Blues in Boston. Toby sez: Solid addition to the PSB catalog; great beats for long car trips. Recommend "Axis", "Thursday", "The Last to Die." Stay tuned for the Critic's movie pick of 2013!